Drug sensitivity and resistance are quantified using IC50 or Emax values, but these metrics suffer from a fundamental flaw when applied to growing cells: they are highly sensitive to the number of divisions that take place over the course of a response assay (see the exploration tool below). Division rate varies across cell lines and experimental conditions. The dependency of IC50 and Emax on division rate creates artefactual correlations between genotype and drug sensitivity while obscuring important biological insights and interfering with biomarker discovery. To address this, we derived alternative drug response metrics that are insensitive to division number. These metrics are based on estimating growth rate inhibition (GR) in the presence of a drug (relative to an untreated control) using endpoint or time-course assays. The latter provides a direct measure of phenomena such as adaptive drug resistance. Theory and experiments published in Hafner et al. (2016) show that GR50 and GRmax are superior to IC50 and Emax for assessing the effects of drugs on dividing cells. Moreover, adopting GR metrics requires only modest changes in experimental protocols. GR metrics should improve the use of drugs to identify response biomarkers, study mechanisms of cell signaling and growth and identify drugs effective on specific patient-derived tumor cells. Through this website we provide an online tool to calculate GR metrics from user-provided data. Scripts are also available on GitHub. Illustration of the dependency of traditional metrics on division time. Simulated data showing relative cell count (green lines) and GR metrics (purple lines) for a cytostatic drug assayed over 3 days across cell lines with different division times. The darker the line, the longer the division time of the cell line (given in days; see key above). IC50 and GR50 are projected onto the x-axis; Emax and GRmax are projected onto the y-axis. Note how the IC curves suggest a more resistant phenotype for slow-growing cell lines whereas the GR curves for all lines overlap, indicating that the GR metrics are independent of the division time. An interactive version of this plot can be found in the Exploration tool tab of this section. Additional information about measuring dose-response curves and calculating GR metrics can be found in the slides from the: ICSB 2017 Workshop on Drug Response Measurement and Analysis. Applications of GR metrics are further discussed in Hafner et al. (2016) and Hafner et al. (2107). Please cite these paper for all applications of GR metrics. The GR metrics model and the associated computational scripts were developed by members of the Sorger lab at the Harvard Medical School (HMS) LINCS Center, which is funded by NIH grant U54 HL127365. The online GR tools were developed by the LINCS-BD2K Data Coordination and Integration Center, which is funded by NIH grant U54HL127624, in collaboration with the HMS LINCS Center. AUC (area under, or over, the curve), which captures both IC50 and Emax to some extent and is more robust to experimental noise than other metrics. More details on dose-response assays and traditional metrics can be found in Sebaugh (2010). Examples of dose-response curves based on relative cell count. In the first example (left), a strong drug response results in an Einf close to 0 and a well-defined IC50. In the second (right), a partial response results in an Einf above 0.5 and an undefined IC50. As an alternative to traditional metrics, we propose to use GR metrics, which are based on inhibition of the growth rate over the course of the assay and are independent of the division rate of the assayed cell lines. Different methods can be used to evaluate GR values. (left) Conceptual approach based on growth rates (k(0) and k(c)); (middle) fixed-interval approach based on cell number at the start (x0) and end of the experiment (xctrl and x(c)); and (right) time-dependent approach based on cell count before and after a time interval 2 <97> Δt (x(c, t ± Δt)). GRinf: the effect of the drug at infinite concentration (GRinf = GR(c→∞)). GRinf lies between -1 and 1. 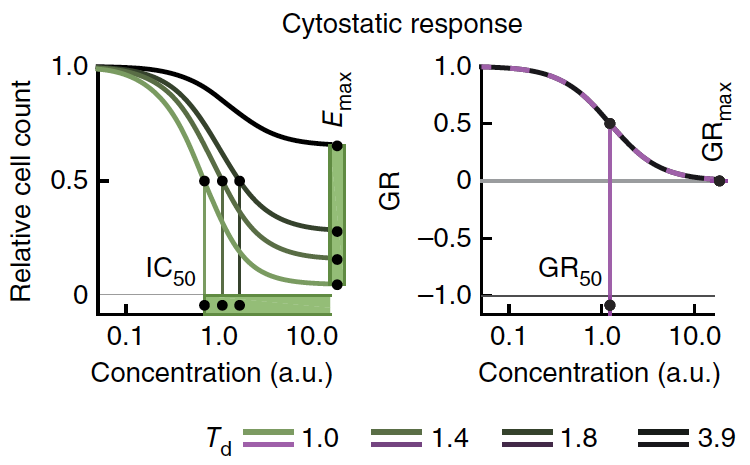 Negative values correspond to cytotoxic responses (i.e., induction of cell death), and a value of 0 corresponds to a fully cytostatic response. hGR: the Hill coefficient of the fitted curve, which reflects how steep the dose-response curve is. In practice, we typically constrain hGR to a value between 0.1 and 5. GEC50: the concentration at half-maximal effect. To avoid artefacts in curve fitting we constrain GEC50 to be within two orders of magnitude higher and lower than the experimentally tested concentration range. (In practice, this is usually about 10-7 to 103 M.) If the fit of the curve is not significantly better than that of a flat curve (i.e., GR(c) ≡ GRinf) based on an F-test with cutoff of p = 0.05, the response is considered flat, and the parameter GEC50 is set to 0. If time-dependent GR(c,t) values are used, GR metrics can be estimated at a different time points to study how sensitivity evolves over time. The GR50 value is the concentration of drug at which GR(c = GR50) = 0.5. If the value for GRinf is above 0.5, the GR50 value is not defined and is therefore set to +∞. By extension, other thresholds can be defined in a similar manner. For example, GR100 corresponds to the concentration at which a drug is fully cytostatic: GR(c = GR100) = 0. For time course data, all metrics are evaluated at each time point individually. where GR(ci) are measured GR values at discrete concentrations ci. GRAOC has the benefit that, in the case of no response, it has a value of 0. It is important to note that GRAOC values (like conventional AUC) can only be used to compare responses evaluated across the same drug concentration range. The GRAOC value captures variation in potency and efficacy at the same time. The calculation of GRAOC at discrete (experimentally determined) concentrations has the advantage that it does not require curve fitting and is therefore free of fitting artifacts. This is especially useful for assays where fewer than five concentrations are measured and curve fitting is unreliable. GRAOC values are also more robust to experimental noise than metrics derived from curve fitting; e.g. 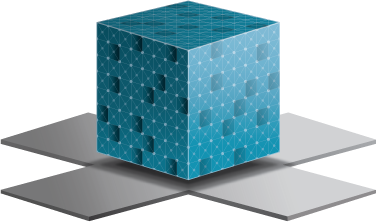 GRmax is particularly sensitive to outlier values when directly obtained from data. Examples of dose-response curves and fits. The upper panels depict strong responses to drugs for which all sensitivity parameters can be defined. In contrast, in the case shown in the lower left panel, GRinf is above 0.5, so GR50 cannot be defined (and thus is set to ∞). In the case shown in the lower right panel, the response is weak and noisy, so the sigmoidal fit is not significant, and a straight flat line is fitted. Nevertheless, only GRAOC and GRinf can be defined. We used computer simulation (see below) to model drug response by three idealized cell lines having identical sensitivity to a partial, or complete cytostatic drug (i.e., a drug that arrests but does not kill cells), or a cytotoxic drug (i.e., a drug that kills cells) and different division times (Td). For example, the lower quartile, median, and upper quartile of the division times for breast cancer cell lines has been reported as 1.8, 2.4, or 3.9 days, respectively (Heiser et al. (2012)). These values are similar to those of NCI-60 cells. In a slow-dividing cell line (Td > 3.9 d), the total number of cells does not double in a typical three-day assay; thus Emax ≥ 0.5 and IC50 are undefined. In the case of the two faster-growing cell lines, IC50 and Emax values fall as division rate increases simply because cell number (or CTG value) is normalized to a drug-naïve control in which cell number increases as division time falls. This interactive model of drug response illustrates the dependency of relative cell count and IC50 / Emax metrics on cell division time. Adjust the sliders to alter the model parameters, or select one of buttons to display the output of the model for a defined drug response profile (cytostatic, partial cytostatic, or cytotoxic). (left) Normalized cell count over time at different concentrations of drug; (middle) the resulting (traditional) dose-response curve and associated metrics; (right) the resulting growth-rate inhibition (GR) dose-response curve and associated GR metrics. where x is the cell count, k is the untreated growth rate (per day), c is the drug concentration, SM is the maximal inhibitory effect, SC50 is the concentration at half-maximal effect of drug, and h is the Hill coefficient. The growth rate k corresponds to the division rate k0 as k = ln(2)⋅k0 = ln(2)/Td, where Td is the division time. SM can be larger than 1 to account for drugs inducing cell death at a specific phase of the cell cycle. This equation for GR(c) is independent of the length of the assay t and the untreated growth rate k, and, thus, the metrics GR50, GRmax, GRAOC, and hGR are also independent of t and k.
Through the accompanying webpages we provide online tools that allow users to upload their own endpoint data, calculate the corresponding GR values and GR metrics, and compare their results across the variables in the assay, such as cell line, agent (drug), time and replicate. Through the above Online GR Calculator webpage, we provide online tools that allow users to upload their own endpoint data, calculate the corresponding GR values and GR metrics, and compare their results across the variables in the assay, such as cell line, agent (drug), time and replicate. Python, R and MATLAB code for calculating GR value and GR metrics is also available in the gr_metrics repository on GitHub. Our R code is also available in the Bioconductor package GRmetrics. The GRcalculator takes in either comma-separated (.csv) or tab-separated (.tsv) files with specified column names. See the step-by-step example. For more explicit instructions, go to the GRcalculator and click "Import Data File" and select a "GR Calculation Method" and "Input File Format" to see the exact columns needed for a particular input style. GR50: The concentration at which the effect reaches a GR value of 0.5 based on interpolation of the fitted curve. GRmax: The effect at the highest tested concentration. GRinf = GR(c → ∞): The effect at infinite concentration based on extrapolation of the fitted curve, which reflects asymptotic drug efficacy. Note that GRinf can differ from GRmax if the measured dose-response does not reach its plateau value. GEC50, the drug concentration at half-maximal effect, which reflects the potency of the drug. hGR: Hill coefficient of the sigmoidal curve, which reflects how steep the dose-response curve is. GRAOC: The area over the dose-response curve, which is the integral of 1–GR(c) over the range of concentrations tested. In addition, the online calculator reports the r-squared of the fit and evaluates the significance of the sigmoidal fit based on an F-test. Further information about these calculations is available through our GR tutorial. Traditional metrics based on relative cell count (e.g. IC50, Emax, etc.) are computed as well for comparison. The results of analysis of existing LINCS dose-response datasets using the GR model are available in the LINCS GR Data Browser webpage. Data Tables displays the uploaded data and calculated GR values as well as the inferred GR metrics. Data can be downloaded in .csv or .tsv format. Dose-Response by Condition plots the data points and fitted dose-response curves for each condition. If no specific conditions are selected, all data will be overlaid on a single plot. To display a subset of the data, select specific conditions to display (e.g. a specific cell line or drug). Mousing over the plot displays the GR values and the corresponding concentration. Plots can be downloaded in a variety of image formats. Dose-Response Grid shows the fitted dose-response curves side by side and grouped according to the selected variables. ‘Selector variable’ and ‘grid variable’ define which plots are displayed. ‘Selector variable’ also defines the variable displayed in the selector box to the left of the plots. GR Metric Comparison shows a scatter plot of the a given GR metric across different conditions. Users can select which metric to plot relative to which experimental variable. Mousing over the plot displays the plotted GR metrics. Plots can be downloaded in a variety of image formats. We welcome your feedback on all of these tools and resources. Please visit our support page for additional resources and to provide feedback.